Couples costumes can be totally adorable, but who really has time to spend hours creating the perfect costumes from scratch? I'm all about easy makeup, and Halloween costumes are no different. These quick and easy couples Halloween makeup tutorials will guarantee you and your S.O. will be the best-dressed people at the party. I, for one, cannot make it through an incredibly detailed makeup tutorial. Yes, I love the end result of a crazy Halloween makeup tutorial, and I even admire the super dedicated people who rock elaborate Halloween couples makeup. But most people I know definitely aren't patient enough to sit through hours of makeup (or do it themselves) just for a Halloween costume. So these tutorials are made for me. When you have the perfect makeup look, it's super easy to pull the rest of your outfit together. For example, if you nail Sandy's blond hair and red lipstick and Danny's slicked back 'do, you'll totally personify Grease, even if the rest of your costume is super low maintenance. Below, you'll find seven easy couples costume ideas, in the form of makeup tutorials. I promise, none of them are super complicated, and if you play your cards right, you can be out the door in under an hour. These two Batman super villains are the perfect easy (and recognizable) couples Halloween costumes. Your mate will have no trouble with the three-step Joker makeup, and you'll love the dramatic look of the Harley Quinn makeup. This costume seriously couldn't get easier. And, if your guy is squeamish about makeup, he'll be totally into this simple unisex look. In fact, it's so simple that you only need one tutorial. You both need jerseys, shoulder pads, and eyeblack. This outfit couldn't be easier. These easy Roy Lichtenstein-inspired makeup tutorials will make you the cutest couple at the party. The best part is, your outfits don't need to be complex. Wear simple head-to-toe black, or channel the 60s and wear mod clothing. Post-transformation Sandy is one of the easiest Halloween costumes around, and this tutorial will show you how to emulate her perfect makeup — fast. Your guy needs Danny Zuko's signature slicked back hair and leather jacket. I personally think John Travolta sported a little eyeliner when he filmed the movie Grease, so if you can convince your guy to do that too, you'll look perfect. Johnny Depp in Pirates of the Caribbean basically made makeup for guys cool, and I for one was super grateful. This easy tutorial will teach your guy how to rock Jack Sparrow-esque makeup, and you'll match with this easy pirate lady look. 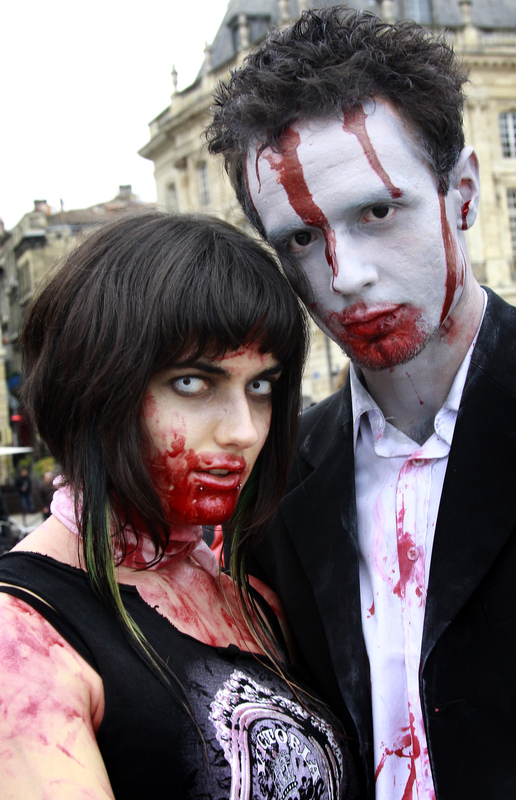 To dress up as vampires, you and your guy basically just need white face powder, fake blood (or red lipstick), and fangs. If you want to go for a more elaborate (but still easy!) look, these two tutorials will teach you how. Nothing says "classic Halloween" like Frankenstein and his bride. Yes, your costume will require a pretty elaborate wig, but you'll save time with this easy makeup tutorial. The Frankenstein look is super easy as well, but make sure you pick up some Halloween face makeup for this costume.